Today, AMD launched its latest line of workstation graphics, leading with the AMD FirePro W9000 Graphics Processing Unit — the most powerful workstation graphics card ever created. 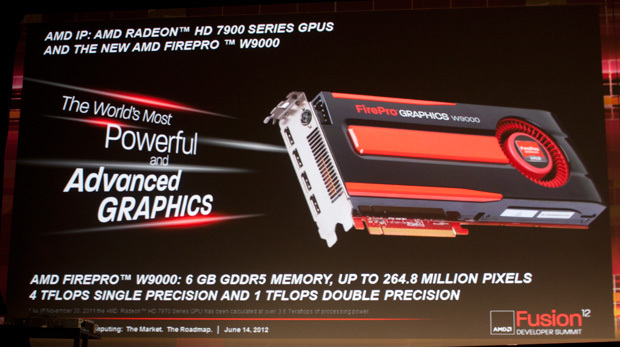 The AMD FirePro W9000 GPU features incredible compute, increased memory bandwidth and greater multi-display support performance than the competing solution. 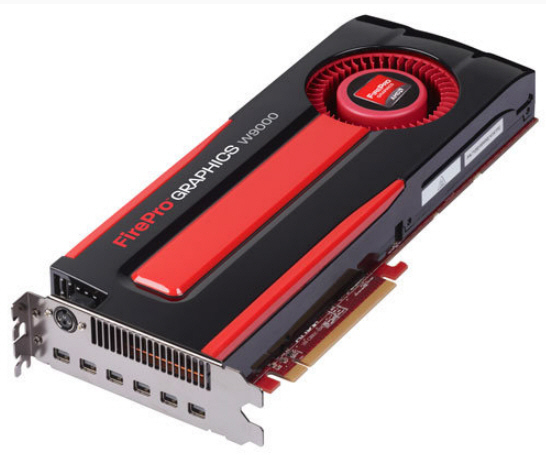 Following closely are the AMD FirePro W8000, W7000 and W5000 workstation graphics cards, all built on the AMD Graphics Core Next Architecture, and designed to balance compute and 3D workloads efficiently for computer-aided design and engineering, and for media and entertainment (M&E) professionals. The AMD FirePro W9000, W8000, W7000 and W5000 GPUs are optimized and certified for leading software applications enabling users to unleash their creativity by ensuring ultra-high geometry performance. The latest AMD FirePro workstation graphics cards can enable smooth handling of complex models and feature dynamic power management that enables great performance and efficient power usage. Using AMD Eyefinity technology, the AMD FirePro W9000, W8000, and W7000 GPUs can drive up to six, 30″ independent displays via Multi-Stream Transport (MST) hubs for maximum workspace utilization at ultra-high 4096×2160 resolutions. With the latest AMD FirePro workstation graphics offerings, graphics professionals can create more complex models and interact with them in real time, helping improve workflows and boost productivity. Through GCN and GeometryBoost, the state-of-the-art AMD FirePro W9000 workstation GPU delivers a record shattering 1.95 billon triangles per second, which is 1.5 times as great as the competitor’s most powerful workstation graphics card, and up to 83 percent greater memory bandwidth than the competing solution, for outstanding application responsiveness. The AMD FirePro W8000 workstation GPU, features Error Correcting Code (ECC) memory support and offers category leading dual-precision compute performance, up to 2.2 times as fast as the competing solution. This helps professionals experience greater accuracy in calculations performed for structural and molecular analysis and computational fluid dynamics without impacting application performance. Not to be outdone, the AMD FirePro W7000 workstation GPU is up to five times as fast as the competing solution in single-precision compute performance, while the AMD FirePro W5000 workstation GPU is the most powerful mid-range workstation graphics card ever created, delivering significantly better resolution, memory and display output performance than the competing card. The AMD FirePro W9000, W8000, W7000 and W5000 workstation graphics cards are optimized and certified for leading workstation applications. Additionally, these new AMD FirePro cards support PCI Express 3.0 and AMD PowerTune and AMD ZeroCore Power technologies for dynamic power management. AMD FirePro W9000, W8000, W7000, W5000 workstation graphics cards are available via AMD resellers and are supported in Supermicro SuperWorkstations. 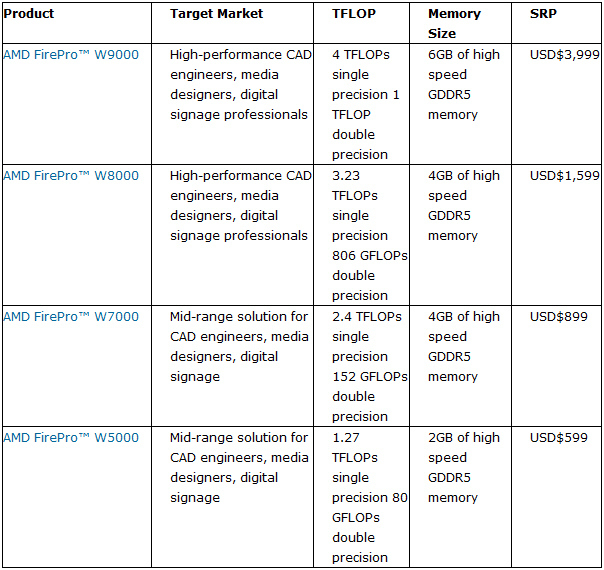 AMD FirePro M6000, M4000 and M2000 mobile workstations graphics cards are also available via AMD resellers and are featured in new systems from HP and Dell.